When you decide to grow in a mid-size space around 4’X4’, selection of right LED Grow light becomes a bit tedious task. Yeah, because growing small is easy and we knows how to tackle with all the challenges we face. Here, our team came up with top rated 3 options as best led light for 4X4 grow tent. 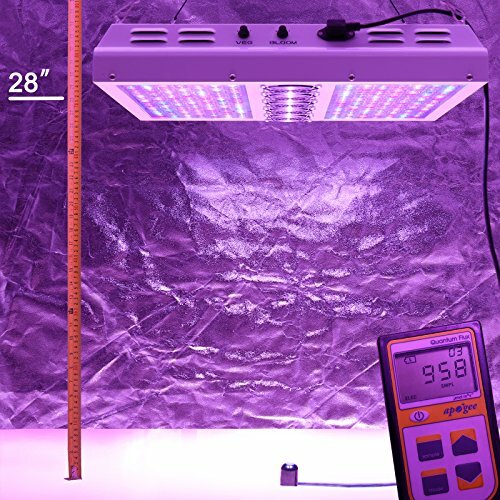 Recently we received a mail from our reader regarding the selection of right type of LED grow light for his 4ft X 4ft grow tent he bought recently. We thought let’s form an article around this topic so that it could help others as well, and boom! Our team started researching and collecting opinions of people who’re growing successfully with more prominent space. The prime goal of this article is to deliver a handful of essential information about LEDs compatible with mid-sized grow space as well as things to consider while growing in a 4’X4’ grow tent. Here are the reviews of Best LED lights for 4X4 grow tent. 1267 uMol @ 18″ Height. We’ve compiled 3 top rated grow lights that also suits your budget. Read this reviews of best grow lights for 4X4 grow tent. You might have heard the name Viparspectra, as its quite famous brand among indoor cultivators. Viparspectra is doing well on the market since a long time back. With time, their product quality is evolved and what they deliver today is a perfect masterpiece. And yeah, Improved product line especially PAR series by Viparspectra is capable of returning your all investment within first 2-3 harvest. No! It isn’t bragging. It’s a raw fact that we don’t hesitate to admit. Now, if we talk about build quality and design, then Viparspectra PAR1200 is equipped with high-quality drivers, perfectly finished aluminum sink,devoted cooling fans and durable body material that can last longer. Viparspectra 1200W LED grow light is equipped with 238 High quality LED chips of 5W each. Also, it is supported by high-quality Zener diode which prevents failure of the entire panel in case any single diode fails to perform. Also, it features two separate Veg/Bloom dimmer nob to keep control over light intensity and brightness. Spectrum is the most essential part when it comes to LED grow light, and we’re glad to state it here that PAR1200 delivers a full spectrum light which includes almost all the essential bands your plants expect from light to thrive well. Also, Yeah, Most vital part for cell building and germination process is the inclusion of IR in the light which is also featured in the Viparspectra PAR1200 Watt LED Grow Light. Also, if you’re planning to grow in a 4’X4’ grow tent, then this light is very well compatible with that size of grow tent. Yeah, it features best in the segment PAR and Lumens balancing. Moreover, it can cover around 4’X4’ of grow space during vegetation while during flowering it will cover around 3.5’X3.5’. If your grow tent has top-notch reflective materials then the combination with this level of PAR it’ll create a brilliant lighting effect inside your grow space which will result in boosting the growth of your plants. Also, Chips are covered with an optical lens which boosts the effect of light and if your grow tent has best reflection results then think how much maximization of light would be possible with this combination? If you’re concerned about PAR results, then this light has recorded around 648 uMol from the height of 36”. However, while cultivating marijuana, we recommend our readers to set it at 24”-28” of height so yeah, for that particular distance you’ll be able to achieve higher PAR results than we mentioned here. Also, actual power draw by Viparspectra PAR1200 lies around 534 Watts. So yeah, PAR1200 is entirely energy efficient compared to other brands in this segment. Now, let’s talk about cooling as it also has an elemental role in the indoor growing. An optimal 4X4 grow tent should have the decent option of excessive and harmful heat and air filtration so that your plants stay healthy throughout its life. Even if your grow tent has less ventilation option compared to other grow tent, then this light will handle the battle. Yeah, it features 5 high-quality cooling fans along with durable and reliable aluminum heat sink. Unlike other LEDs available on the market, Viparspectra PAR series has a change in fan placement. Yeah, it features cooling fans on the front side of the panel which plays two roles, first is to keep light cool and second is to deliver fresh and cold air towards your plants. For some people price of Viparspectra is a question but still, we choose it as our editor’s choice product for one of the Best LED light for 4X4 grow tent due to the reasons mentioned above. Moreover, the manufacturer offers 3 years warranty along with product and 30 days money back policy in case you don’t feel satisfied with this masterpiece. Also, we’d like to state it here that PAR series is much more advanced compared to Viparspectra Reflector Series. An LED light is something that plays a role of the game winner. Yeah, selection of a right grow tent don’t end the game here. Also, that’s what this 100+ indoor cultivators had done by choosing right grow light for their grow space. We’ll surely recommend Viparspectra PAR1200 1200W LED because with the features and capability offered by Viparspectra PAR1200 our team decided to place it on the top of our list of Best LED Light for 4X4 grow tent. The second best alternative for 4X4 grow tent is 900W Variant by Mars Hydro. Yeah, it’s a famous brand for hydroponic and indoor cultivation tool manufacturing. The best thing we noticed about the brand Mars Hydro is they deliver quality at an affordable rate. Yeah, as we already stated light quality plays an essential role as far as marijuana plants are concerned. If we talk about MARS II 900W Full spectrum light, then it is built using extremely high-quality materials. Parts used in its making are either from the manufacturer itself or from well-known brands on the market like epistar and bridgelux. Yeah, 900W Grow light in MARS II series is equipped with 180 LEDs of 5W each. And creates highly effective full spectrum light effect which includes the range of bands between 400nm – 740nm and also includes essential white color and IR band. 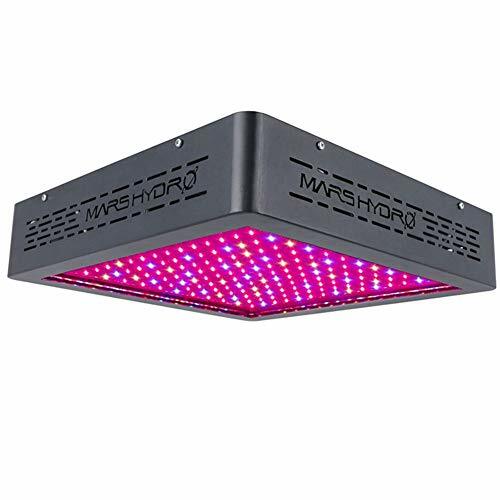 In case, you’re planning to use Mars II in a 4X4 grow tent then your plants will get potential growth due to the intensity and brightness provided by this grow light. Now comes the crucial factor, yeah, it’s coverage potential. As far as coverage is concerned, Mars II 900W is capable of covering 5’ X 5’ grow space at max as decent footprint achievable for this level of area. However, as maximum PAR value achievable from the height of 18” is 1267 uMol and hence we’d recommend you to keep at 18” of height during flowering and 24” height during vegetation. Yeah, we’re recommending this height by keeping the light intensity and need of your plants in mind. Moreover, from the height of 18”, you can achieve around 3.5’ X 3.5’ of coverage with ease on the other hand, from 24” you’ll quickly get around 4-4.5’ X 4-4.5’ of coverage for your plants. Also, it is a daisy chainable variant, so in case you plan to upgrade your grow space in the future up to 10’ X 10’ of coverage then you’ll easily be able to connect another light for achieving same results in that grow space. Now, if we talk about power efficiency, then it won’t disappoint you in this factor as well. Yeah, light pulls around 375W from the wall which is lowest in the segment. Moreover, it also helps in saving a lot in terms of electricity costs in the longer run. For cooling and temperature balancing, Mars II 900W is equipped with 4 high quality and performance-centric quiet cooling fans along with scientifically designed heat sink. Mars Hydro is hot favorite brand among cannabis cultivators since it could deliver high-quality light at very reasonable rate. And, this fame could be imagined with the help of this highly satisfied customer’s reviews on Amazon. Along, with the perfect design for a 4X4 grow tent, high-quality light, performance capability and reasonable price mars hydro also offers 3 years of maintenance and customer support and 30 days money back policy for its product users. People using it has reported better flower quality after using it. Coverage potential along with higher absorption rates. In built timer facility is not provided however it could be controlled via timer. If we keep all the specification and performance report submitted by existing users in the center, then we don’t find any reason to eliminate it for a 4X4 grow space. However, Mars II 900W and Viparspectra PAR1200 similarity in all the performance factors only difference we noticed is price and power draw. On another end, both brands are doing well on the market and succeeded in winning the trust of people by providing quality for plants growth and better results. So yeah, we’d say narrow down your needs and requirements and go for the one which suits you. In case, you want to play safely in longer run go for Mars II 900W LED grow light that’s all we’d say. Yeah, you catch it right. Our last recommendation isn’t an ordinary LED grow light, but it’s a modern art technology packed COB light in our list. There are several reasons behind including it in our list of top 3 best led grow lights for a 4X4 grow tent. We’ll talk about all of them in this COB grow light review. However, we’d still like to disclose prime selection factor here, yeah, take a look at Maxbloom COB’s price here. Got it? Yeah, if a state of the art tech is possible at a lower price than ordinary old fashion light then why not to choose the one? 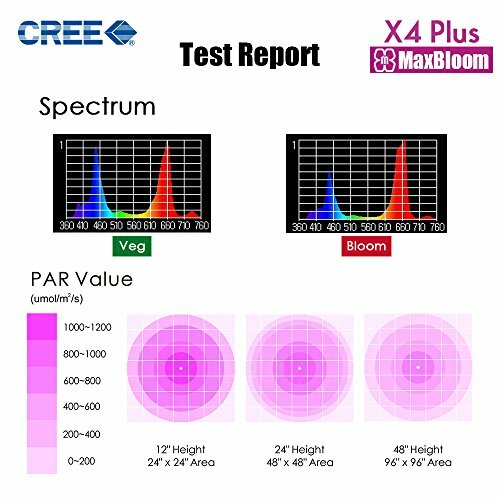 Now, let’s talk all about Maxbloom X4 Plus. 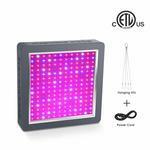 [easyazon_link identifier="B07GJJ1MKT" locale="US" tag="420egarticle-20"]Maxbloom X4 Plus COB LED Grow light is equipped with a combination of conventional LED chips and advanced COB placement in the center of the panel. Combining all the lights it generates an optimal spectrum effect for green plants which includes almost all most vital and essential bands in it. Also, COBs in the center maximizes light effect and intensity by delivering highly bright lights all over the grow space. All in all, for spectrum, intensity and brightness we’d give 10 out of 10 to this Maxbloom grow panel. Also, silicon rubber cover on body provides extra safety from regular water dripping issues in growing space. In case, you’re thinking that it’s a COB so it would be drawing a lot of power for its working then I suppose you might be wrong, as it only pulls around 200W of electricity from the wall. Also, grow light features two separate dimmer knobs for managing light brightness during various stages of plants lifecycle. Yeah, during vegetation your plants would crave for blue lights so you’ll have to set veg and flower knobs accordingly so that it delivers a much-needed quality of light to the plants. In flowering too, you’ll have the convenience of keeping things in the control using this knobs. Now, comes the most vital part which will determine whether it is suitable for your 4X4 grow tent or not. Yeah, it’s coverage. 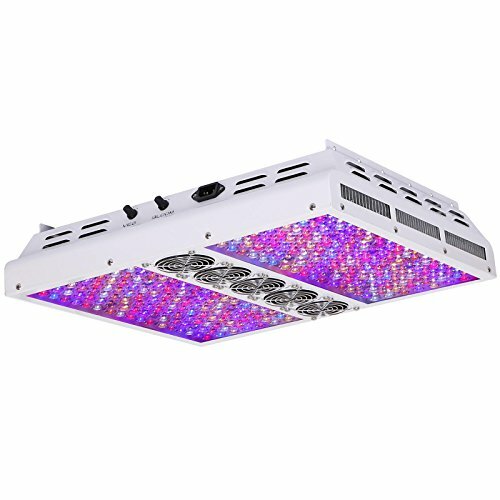 As far as coverage capability of this grow light is concerned, it can cover around 4’ X 4’ of grow space easily from the height of 24”. Also, beneficial part here is its brightness potential will boost depending on your grow tent reflection. Also, we’d recommend you to go for a light leakage proof grow tent in case you’ve not bought one yet. Research and development team behind its design had kept all the things in mind while designing this product. 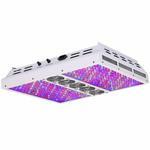 For cooling, they’ve equipped grow light with multiple cooling fans and high quality and reliable aluminum heat sink. Combination of both these parts takes care of temperature balancing in a perfect manner. Maxbloom is the quiet famous name, and they’re performing fabulously on the market since a long time back. Hence, MaxBloom X4 Plus 400W is delivered along with 5 years hassle free warranty. However, we approached the people who’re using it since a long time and asked whether they faced any issue with the product or not? Their response indicated that everyone could go for it with confidence as the majority of them are still using it for more than 6 years in their grow space. 5 year warranty period is longest on the market at this rate. It is not daisy daisy chainable. COB technology is getting famous due to light effectiveness nowadays. Majority of growers are moving towards top rated COB grow lights since its most active and modern technology as far as growing and gardening future is concerned. We’re recommending MaxBloom X4 Plus to all our readers in case they’re planning to use it inside their 4X4 grow tent. 4X4 grow space is perfect as a general starter criterion. We often recommend our readers to start with moderately sized space where our recommendation lies between 2X2 to 4X4. Yeah, the prime reason for this recommendation is you can get better with this sized space. Also, it becomes easy to test things while growing in a 4X4 grow space. Nowadays, the majority of grow tent suppliers, and manufacturers provides reflective materials as interior fabric. So that light could revert to the plant and to make it possible to absorb almost all the lights generated inside grow space. So, yeah, to decide one of the best led grow light for your 4X4 grow tent sort and finalize based on Power efficiency and your budget. Yeah, as our expert team has cross-checked all other factors and we’ve verified the facts and figure by reaching out to the existing users. So, as help in the decision-making process, we’d like to recommend lights based on budget and power efficiency. Hence, a person with a low budget and top-rated power efficiency should go with Maxbloom X4 plus. On the other hand, for a bit better performance and results you’ll need to stretch your budget further and could select either Viparspectra PAR1200 or Mars II 900W LED grow light for your 4X4 grow tent. Prime goal of this article was to pass on budget friendly grow light and hence we’ve not included Advanced Platinum Series P600 Grow Panel or G8LED 900W Grow Light for Indoor gardening in our list as these are high end lights made for open budget people with higher requirements.